Thinking about your next summer’s Workamping gig? Don’t rule out northwest Michigan. With all the inland lakes and streams, as well as the Great Lakes, Michigan truly is the Water Wonderland of the country. So much to see and do in Michigan and with this job you have every other week off (that’s seven days straight) and you typically only work about 3-4 hours the days you are on duty. 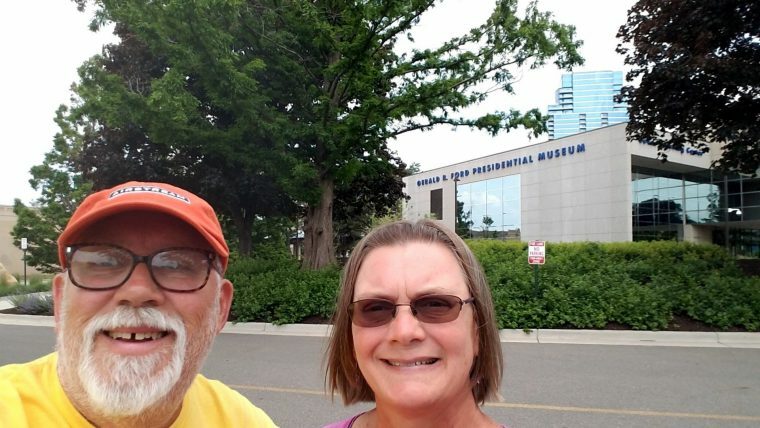 Our road trip a few weeks ago took us up M-22 and M-119 through Charlevoix and Petoskey and on up to the Mackinac Bridge and across to St. Ignace. On our way back down into the Lower Peninsula, we needed to head to Kalkaska on M-66 to visit my parents grave. This return trip took us to a delightful little Village of Ironton where there is a ferry that crosses the “narrows” of Lake Charlevoix giving riders a shortcut from Boyne City to Charlevoix. As we had already spent a thoroughly enjoyable time in Charlevoix the previous night, we instead crossed on the ferry and headed south on M-66 to Kalkaska. I thought the ferry was so cool. A ferry boat has been crossing this narrows since 1883, with this present vessel being placed into service in 1925. On most boats, ferry or otherwise, the captain (or pilot) not only controls the engine speed and direction, but also steers the boat by use of a rudder and/or bow thruster engines/props. With this ferry however, the craft is “driven” by propellers on each end (from one small diesel motor that runs in both directions) but the direction that the boat travels is guided along by a 3/4″ diameter steel cable that is secured at the ferry dock at each end. There is no steering and there is no rudder. Back in the “old days” the passengers provided the power by pulling the boat along using hand-over-hand power on the cable. “How do boats navigate the narrows” you ask? There is enough slack in the cable so that it is only above the surface of the water at each end and at the ferry boat itself. Otherwise the cable drops to a depth of about 25′ so that other watercraft can safely navigate. We are continually amazed and delighted at the opportunities that this workamping lifestyle affords us. Although we were both born and raised in Michigan, we continue to be pleasantly surprised with all that this beautiful Water-Winter-Wonderland has to offer.